Repeated rows of small beading. Used on decking boarding. A small rectangular section that has a half round on one end. Used to separate the sashes in a sliding sash window. Usually half-round grooves. cut into the surface of a column in regular intervals. 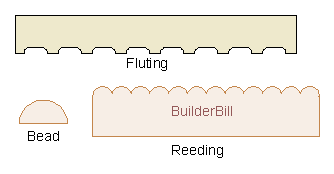 A sketch showing a a bead, fluting and reeding. Quite often these days we get decking boards with a reeded face. Well my theory is that the reeded side goes down. The reason for this is that decks being outside and in the wet, the interface between the bottom of the board and the top of the floor joist holds moisture and so promotes rot in both. Just about ever old deck that I have removed shows this and it includes rusted fixings also. The gaps in the reeding allow faster drying out of that interface and so it retards the onset of rot. But there is no accounting for taste and many people insist that the reeded side looks best and some like the non-skid characteristics. 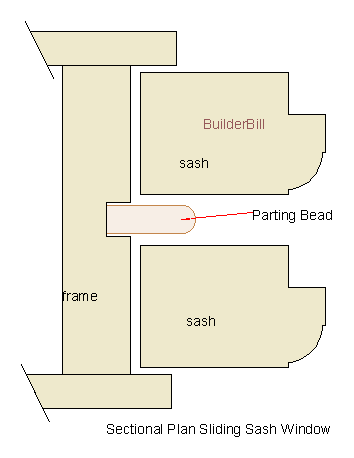 This is a common way of using the half round bead, setting it in from an edge. In this case it is a pair of meeting stiles for double doors. Doing it this way the two stiles look even in width from each side. Another common use is to put smaller beads still to the face side of tongue and grooved boards used as infill panels in doors or as wall panelling. Made for a specific purpose the parting bead is used in sliding sash windows but like most of these mouldings it does get used for other odd jobs. 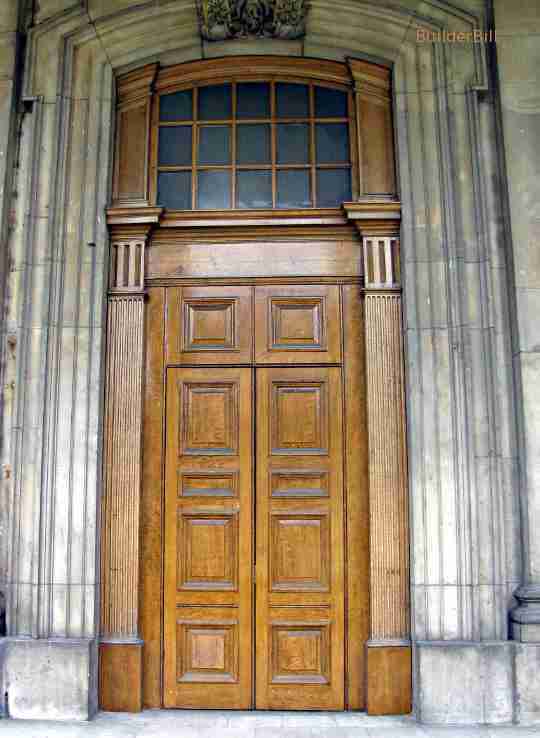 Here is a pair of English Oak doors seen at Greenwich in the UK. 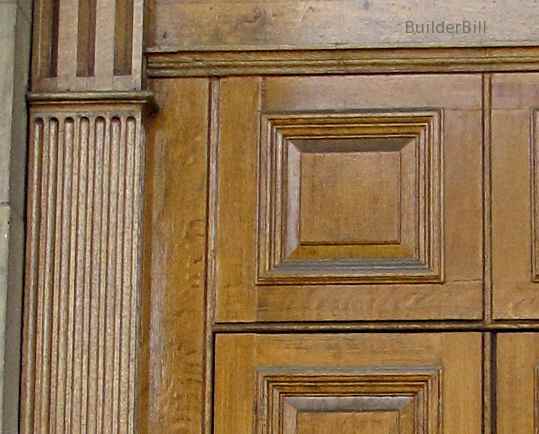 Looking closely we can see that beading is used at the joining stiles of the doors, between and under the top fixed panels and that some really well done fluting is used for the architraves.